Noelani Perez and Emily Novick. Dianna Juechter and Skyler Alexandre. Volunteer work presents a great opportunity for teenagers to prepare for the future, as well as to improve their communities. 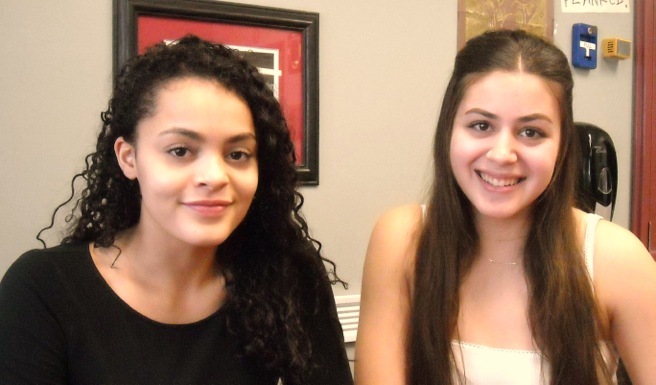 Students Noelani Perez and Emily Novick serve on the Students Against Destructive Decisions (SADD) Club. They have learned how to do outreach to the student body regarding: preventing teen substance abuse, improving traffic safety, Red Ribbon Week, signs of opioid abuse plus ‘Heroes and Cool Kids’. Teen substance abuse is neither healthy nor legal. The number of dangerous mind and body-altering substances that are easily available are growing, from alcohol and tobacco products, prescription and illegal drugs to products found in the home that are used to get high. The SADD club volunteers equip students with information on how to recognize signs and symptoms of substance abuse and how to seek help for themselves. Vehicular crashes are the number one killer of teens in the United States. SADD’s programs, awareness campaigns and advocacy efforts have been focused on reducing the number of teens injured and killed behind the wheel. Distracted driving is an activity that diverts attention from driving that includes texting on the phone or eating and drinking. Impaired driving involves operating a vehicle, while under the influence of alcohol or drugs. Red Ribbon Week is an alcohol, tobacco and other drug and violence prevention awareness campaign observed annually in October. Its purpose is to present a visible commitment to living a safe, healthy and drug-free life by wearing a red ribbon. The opioid famly of narcotics, which includes codeine as well as strong medications, such as oxycodone and morphine, has many legitimate medical uses. Codeine is an efficient pain reliever and cough suppressant, while stronger opioids are usually used for control of severe chronic or acute pain. Because of the way opioids affect the brain, these substances have the potential of becoming addictive. Addiction to opioid narcotics causes severe physical and mental health problems. The ‘Heroes and Cool Kids’ program is helping to curb bullying by teaching high school students the best way to instruct elementary school students. Noelani and Emily attended courses at Bergen Community College to implement the program in the district’s elementary schools. The children are taught about sportsmanship, anti-bullying, leadership and positive life choices, such as staying away from drugs and alcohol. 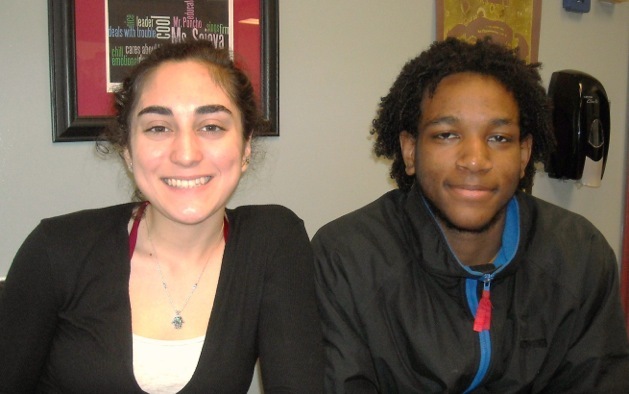 Students Skyker Alexandre and Dianna Juechter volunteer for their club ‘Students Opposing Starvation’. They recounted their activities that included ‘Empty Bowls’, Soup Kitchens, Midnight Run and the Senior Citizen Prom. The Empty Bowls Project is a crafts-based effort to end hunger. In the ceramics class, students throw, decorate and fire the bowls. On the day of the event, students set up a long table to display the bowls. Soup and bread are served to the visitors for a donation that goes to a food bank. The visitors are asked to keep the bowls they selected as a reminder of all the empty bowls in the world. Midnight Run is a volunteer organization dedicated to find common ground between the housed and the homeless. Midnight Run volunteers from schools and other civic organizations distribute food, clothing, blankets and personal care items to the homeless poor on the streets of New York City. The goal is to forge a bond between housed and homeless people by establishing a foundation of sharing and caring from which solutions may be found. The nonprofit soup kitchen and pantry network provides hot nutritious meals for hundreds of people in desperate need of food every day. In addition to the hot-meal program, bags of much-needed groceries are given out weekly to those who do not have enough food at home. From dinner to dancing and festive attire, proms for senior citizens bear a close resemblance to the prom held at local high schools. High school volunteers help by setting up, attending the event, dancing and socializing with the senior attendees. Nyack High School has participated in these proms to provide students with the experience of service to elders and a social opportunity to interact with the elders of their community. The intergenerational experience enables students and senior citizens to learn from each other through their positive interactions.